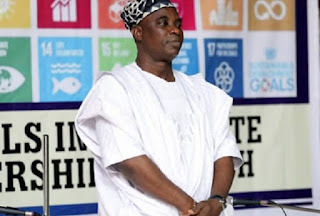 Popular Nigerian Fuji musician, Mr. Wasiu Ayinde has been decorated the UN-SDG Ambassador by the Civil Society Coalition on Sustainable Development at the International Stakeholders Conference on SDG. According to Nigerian Tribune, the event took place at the Cultural Centre Kuto, Abeokuta, where many dignitaries including the Ogun State governor, Senator Ibikunle Amosun witnessed the colourful occasion. Mr. Ayinde was honoured by the UN barely a few days after he celebrated his 61st birthday. The Fuji musician was honoured because of his contribution to humanity through his music, said the organisers while citing the reason why he was selected. The musician received the award alongside other honorees like the Ogun State First Lady, HE Olufunso Amosun, prolific film maker, Tunde Kelani and many others. The Civil Society Coalition is affiliated with the United Nations and it has over 150 registered civil society and non-governmental organisations under its fold in Nigeria.